It is commonly said, all artists must visit the Hill End and Sofala gold-towns of NSW. True, there is unlimited scope of scenery to paint, unique to that location. Many of our best known artists over the years were to work there, Drysdale, Friend, Olley and Whiteley. Some even moved to the area. But while they found such a diversity of Landscape, having a Surrealists mind this area offered me so much more. The nearest to formal art tuition I ever had was in high school, as an elective subject – all one and a quarter years of it. Probably the best part of it was a 16 mm movie on Russell Drysdale that went around the school circuit produced by Qantas in 1962 *. Such films were shown in lunch break in a room down-under. Drysdale’s work, his brilliant colours, twisted body shapes and darting action of his shadows of the Australian people, just so grabbed me I went back to see re-runs of the film. My all time favourite work probably of any artist was Russell’s ‘The Cricketers'†. Always I thought this scene was way outback some place. No, soon as I started exploring Hill End in 2010 I would discover the old brick double story building in the painting was none other than an old Hill End Pub and one time bank, long ago pulled down with foundations only now remaining. 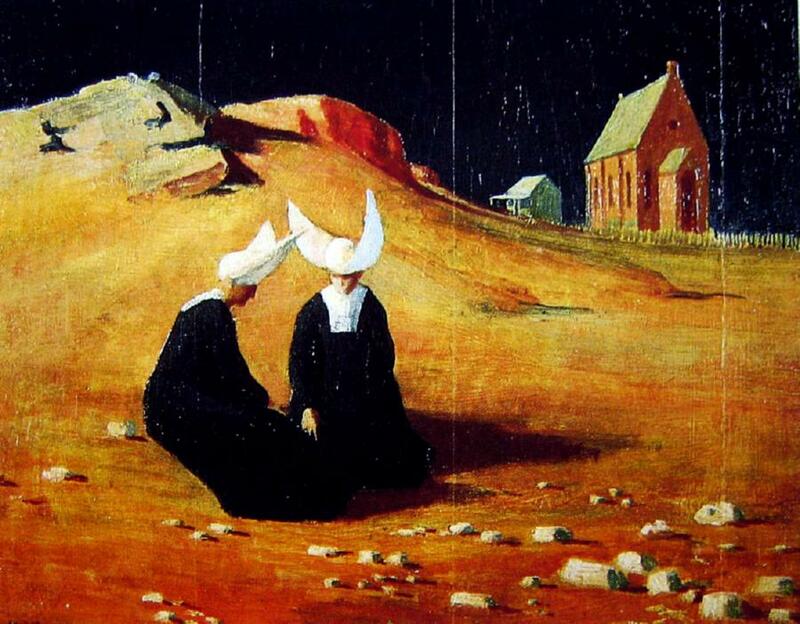 While ‘The Cricketers’ had been my long time favourite, more recent years I discovered ‘The Nuns' Picnic’†† by Jeffery Smart. It conveyed to me an incredible feeling of isolation but in the most perfect setting. Somehow I assumed the little isolated church in the background was at a NSW seaside location. No, once again, Hill End. I consider it astounding that my now two most favourite paintings, that both scenes would be so close to one another, actual location wise, that you could nearly throw a stone between. How do I interpret why the two paintings I have most liked would both be based on the same tiny town, a stone’s throw apart, by two artists of the same vintage, yet seems from researching art history these two did not associate. * I now have a DVD copy of this film acquired through the Nation Film and Sound Archive.